There’s a game I remember from childhood parties at my grandmother’s house. A tempting bar of chocolate was set on an table in the middle of a ring of children. Each child had to throw a pair of dice and if you got two sixes, you had a chance to go to the table and eat the chocolate. Before you could do so, however, you first had to put on a large pair of mittens followed by a woolly hat and scarf. Then, and only then, could you go and attack the chocolate, which you had to eat with a knife and fork, but woe betide you if another child threw two sixes before the process was complete. I was reminded of that game this week in the dental room. Whenever we are using the ultrasonic descaler, we put on protective gloves and a face mask and normally this takes seconds. However, for some reason, the latest batch of masks are different from normal. Rather than elastic which slides easily behind your ears, these have individual ties, one set at the top and one at the bottom. Twice this week, one of my colleagues has come to me and asked, ‘Could you just begin this dental for me?’ and both times I have found myself putting on the latex gloves first (as I have always done in the past) and then went to put on the mask and found myself fiddling around for ages, trying to tie the bows at top and bottom. It sounds easy, but what with trying to get both tight enough so that the thing doesn’t slide off, and with my hair getting woven in, all hindered somewhat by the tight gloves which seemed specially designed for hair tanglage, I was inexorably reminded of the chocolate game as I wondered frustratedly whether the colleague in question would return before I had even managed to don the protective clothing. I seem to have spent a lot of time in the dental room this week (not all of it getting myself tied in knots). Dagny called me in yesterday as she had decided the dog she was working on needed to go on a drip. Irene came to help me to put in the i/v catheter and both of them watched with some sympathy as I doused the leg in alcohol and then started doing the traditional ‘my fingers are nipping’ dance where you jig around the room shaking your hand where the alcohol has entered a wound. ‘Is it sore?’ Dagny asked (in Norwegian you understand). ‘Yes,’ I gazed down at both thumbs which were stinging horribly. ‘I must have a hole.’ It took me a minute or two to register that both Irene and Dagny were laughing at me, and a moment longer to realise what I had said. Of course we have been in this position before, only in English and with the roles reversed. Existing in a language that isn’t your mother tongue really does lead to a lot of faux pas. ‘Ahem. Sarah.’ It was that tone. The one that lets me know I have missed something. I turned round… and realised that as I had hung up the drip bag, I had inadvertently turned the spotlight out. Dagny was trying to work in the dark. Fortunately she just laughed at my expression and carried on. At least she was using the light as it was meant to be used. Later in the day, in a moment of confusion, Wivek pulled the light fitting into position against a cats jaw. This would have all been very well if she was needing more light, but as she was trying to take an x-ray at the time, it was somewhat ineffective. The cat in question was a beautiful cat called Laila. Earlier I had gone into Wivek’s consulting room to help with her sedation. It can be difficult to get cats out of their baskets when you want to examine them, but I was amused to see that Wivek, in a continuation of last week’s singing, decided that the way to charm Laila from her cage was by chanting her name very tunefully over and over. It was at least partially successful. Laila’s head appeared as she looked outside to see who it was who was singing so beautifully. Poor Laila. It must have felt a bit like the Siren’s song: irresistibly sweet, but concluding with an injection that sent her to sleep. Though whether those who were seduced by the real Sirens woke up with beautifully clean teeth, no-one will ever know. Marita too was thinking of a change in direction this week as she stood in theatre, removing some tumours from a dog. She had discovered the pleasure of removing lipomas (fatty lumps) from under the skin by ‘dissecting’ bluntly using her fingers. It’s amazing how efficiently a lipoma can be removed as they are usually well defined and ‘shell-out’ quite easily. ‘I feel like a messy chef,’ she commented idly as she ran her fingers around the mass. She didn’t seem particularly amused when I suggested that after she was finished, she could use the lumps to make meatballs. 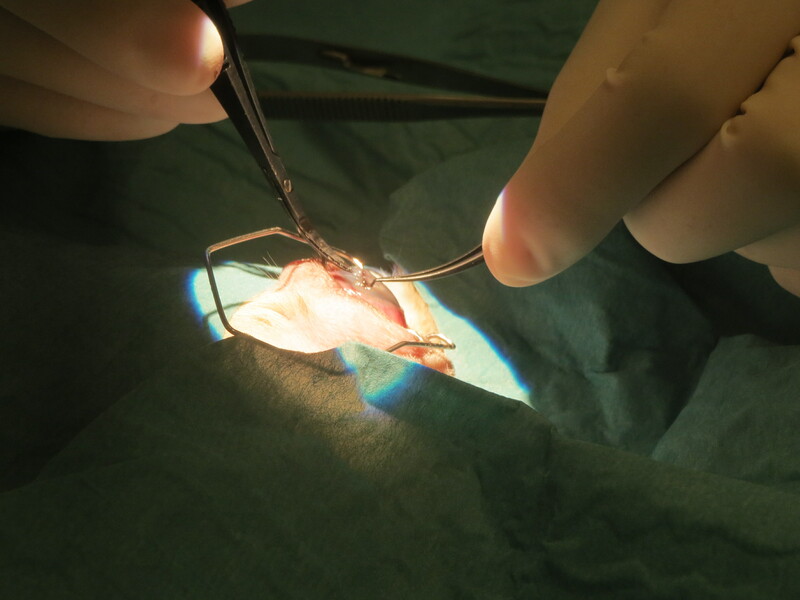 This week’s picture is of Dagny suturing a puppy’s eye. The unlucky pup had been scratched by an angry cat and as you can see in the picture, Dagny used the microscope to carry out the repair to the cornea using tiny suture material that was about the same thickness as a human hair. After stitching up the breach, Dagny clipped a section of the conjunctiva and sutured a flap over the damaged area both to protect it, and to carry blood to the area, which has no natural blood supply. The flap will be left in place for at least six weeks. Dagny’s final act was to inject some fluid into the front of the eye to make up for that which had leaked out. The whole process was utterly fascinating. Best of all though, without such care, the pup would have definitely lost one of her eyes. Hopefully this operation will give her a chance to grow up with both.